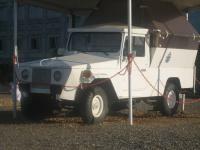 The popular military truck Matador was slow, but had a good cross-country ability. But the British decided not to dwell on this and have created a half-tracked tractor on its chassis. The "donor" to a caterpillar mover was a "Vallentyne" tank. Caterpillar mover takes up almost the full length of the truck, and that's why these trucks are called in English literature as 3/4 tracked (not half-tracked). Other details about this vehicle are unknown, but there was no mass production of this truck.